After a great season and a great year I am now pleased to receive the support and sponsorship of Huub. This is a great wetsuit based company in triathlon and I can't wait to race form them next year. It was really great to visit the Huub HQ and meet with the founder Dean Jackson and his team. Speaking with Dean it was clear that the company have a real passion for Triathlon and their products and a real interest to help and support. With some differences in buoyancy in the wet suits Huub kindly allowed me to try out the women’s Aura and Axena and the new Huub goggles. In this blog post I will give you my view and opinion of the products so far. I am currently 5ft 5 tall and weigh 7 stone 5 pounds so I am quite tall and thin at 16. Looking at the sizes I would have selected the XS but after talking with Deano and having a proper fitting which included learning how to put it on properly I will wear an XXS. There is a video below were Deano will show you how to make the most of fitting the wetsuit. I learnt quickly that this is an important part of getting the best out of the suit. · Unrivalled 4mm neoprene for correct buoyancy level and all over body flexibility never before offered in a female suit. · Neoprene flexibility, thickness and stretch combination unmatched in the industry. · Breakaway Zipper, the quickest in Triathlon. · Unique combination of lining materials. So here is my view on each suit, firstly, the Aura which is a 4:4 is an amazing suit. It has 4mm all over neoprene giving a level buoyancy and all over body flexibility which is great. I found it was just the right buoyancy to keep me high in the water. This helped me keep good technique which is important in long distances, also the flexibility in the suit was wonderful around my shoulders, there was no strain at all it felt as if I wasn’t wearing a wetsuit. The wetsuit positioned me high in the water this means I could put less effort in when swimming as there was less drag through the water. The break-away zipper was unbelievable quick and easy, surely saving precious seconds in transition and the suit slipped of easily. I would defiantly recommend this suit to anyone of any race level in triathlon. The next suit I tried was the Axena. The suit has 3mm exclusive upper body and a 5mm lower body. I felt in the water that this gave me really good flexibility in my arms while adding buoyancy in the legs. Looking at the suit with my swimming coach he thought it was a great suit for me as it kept me higher in the water which is the position I want to be in the water. With the legs being 5mm, this meant my legs were low enough to kick in the water but when not kicking they were high enough to reduce drag. My coach looked at the flexibility in the suit and thought I had a much better range of movement in particular the calf release section gave me the calf muscle freedom of movement so I felt no restriction whilst kicking. The breakaway zipper is I think, one of the best changes I have seen in a wetsuit as it is so fast and quick to take off it’s defiantly the quickest I have ever used. The removal of the suit without the aid of baby oil was a dream….off in seconds. Finally the design and the way it looks is very smart (these nothing wrong with looking goooood). In our trials over a 50m sprint I dropped 5 seconds on my normal pool times which is a massive drop. With my coaches help we have selected to use the aXena next year, as I found it gave me great benefits in flexibility buoyancy and speed. 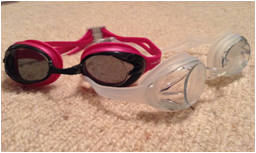 I was lucky enough to be given the new Huub swim goggles, one with clear lenses and one with dark lenses. The Goggles are a great fit round the eye giving you maximum eye view they are also an advantage over previous goggles i have used in that they are a little deeper so my eye lashes do not touch the lens. The material felt comfortable and they don't irritate the skin around the eye. I like the design of one strap into two off the goggle lens as this means they won’t get tangled and are easy to get on. The strap splits into two so you can have them on different lengths to suit your head shape and also girls can have one strap below their ponytail and one above, this helps them be more secure. I also like the lenses in them as they are very clear and didn’t fog up, the lenses stayed clear after each rep in the pool and you don’t need to take them off to see the next set written on the white board. I would defiantly recommended these goggles to anyone and I would give them 9/10, the reason why I can’t give them a 10 is that I have only had them a week and don’t know how they will wear in the future.